Don't get caught riding in wet weather without your rain gear! 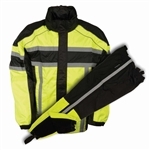 Our motorcycle rain gear, suits & accessories are sure to keep you & your belongings dry in wet weather conditions. 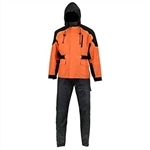 It is essential to choose the proper rain gear suit for riding a motorcycle. 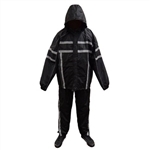 Rain suits available at non-motorcycle stores are not made to withstand the heat that the motorcycle pipes give off. Our motorcycle rain gear is made from heat resistant materials that will not melt or damage your motorcycle and it is made to fit over your normal riding clothing.